It is no secret that hard drive (the spinning disk variety) prices are crazy at the moment and that the floods in Thailand are the majority of the cause. It was just a little over two months ago that I was looking at terabyte drives to maybe fill out a simple NAS at my house. At that time, drives were sitting around $80 for a terabyte drive. However, today, this is what I have to pay for a terabyte drive. Yeah, prices have doubled and now we have news of manufacturers running out of high-capacity (2TB+) drives and pushing custom machine build dates in the future (from Ars Technica). That change in price makes a custom-built NAS a little bit less desirable at the moment. SSDs look far more desirable, not because they’ve come down in price, but because hard drive prices are going up. A 128GB Samsung SSD sits around $200 and you get the massive speed increase. That Time Capsule I was talking about before looks a lot better when 2TB of traditional storage can cost me $320 for just the drives. A refurbished one costs $250 from Apple and comes with the same warranty. That’s cheaper than plain drives at the moment. Now, you can get a 2TB drive for less, but you still need to get the rest of the hardware to support your NAS. I know that. You also still are locked into a single size for your Time Capsule. Understood. However, it does look far more desirable with prices where they are right now. With Christmas coming, maybe I’ll look into getting one just to have another layer of backups available at home. Right now I’m using SuperDuper! to make clones of my wife’s MacBook just in case something happens, but having Time Machine always sitting vigilant would make me feel much better. 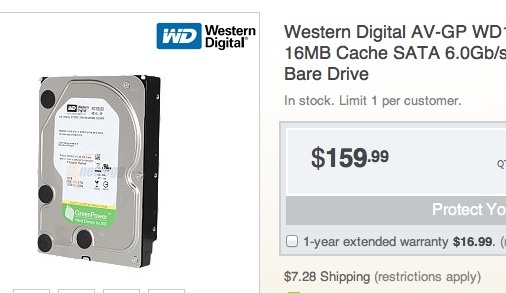 Just an interesting side effect of the rising hard drive prices.